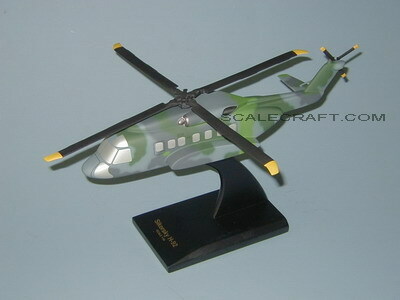 The S-92 medium lift twin engine helicopter is manufactured by the Sikorsky Aircraft Corporation. The S-92 is an evolution of Sikorsky S-70 US Army Black Hawk and US Navy Seahawk helicopters and is available in a 19-seat passenger commercial, a 22 troop utility and a number of mission-specific configurations including Search and Rescue (SAR), government and VIP transportation. Solid resin. Scale 1/48. Rotorspan 14 inches, Length 15 inches.